£499 offers unprecedented value. Even if you can afford the fully-fledged Custom Shop equivalent, we'd recommend trying out a Classic Player first. 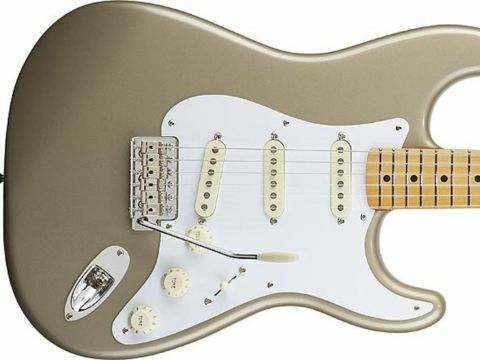 Although Fender's Custom Shop produces some of the most desirable guitars available, and even though it would seem that the designs are only limited by imagination, it's often the beautiful recreations of specific guitars from the fifties and sixties that attract the highest levels of interest and acclaim. The Custom Shop employs a small number of masterbuilders to apply their stratospheric skills to not only a selection of limited run guitars, but continuing output of Tribute models and custom-ordered one-offs. Stock and Custom Teambuilt guitars are pretty special in their own right, but to run your hands over a Masterbuilt guitar is an almost religious experience, and the idea behind the new range of Classic Player Fender Stratocasters is to try and bring some of this magic to the hugely popular mid-price Classic Series. "Around the time I became the Fender marketing manager, senior masterbuilder Chris Fleming had been helping out with some general processes at our Ensenada factory, and was amazed at how impressive that facility had become, how knowledgeable the staff were, and what they were capable of. "He ended up designing a guitar that he brought to me as a possible 'Factory Special Run' and from that spark we decided a small special run would be short shrift for such a great concept, and that it should be fleshed out into an actual line of instruments. "When you buy a Custom Shop instrument, you are getting two things: the 'head' - the builder's expertise and knowledge, and the 'hands' - the actual building," he explains. "With these Classic Player instruments, you are getting the 'head', but it didn't stop there: this wasn't just a list of ingredients and components that was facelessly furnished to the factory to be built. "The masterbuilders went down there and showed the people who would be building these instruments how to do things their way: finishing the custom shaped necks, softening some of the blends, and so on. It was a true collaboration from start to finish." Although the question of exactly what the Custom Shop team brought to Ensenada has to be asked, Chris Fleming is understandably reticent in spilling too many beans: "I interfaced with the Mexico team to develop a 'thin skin' polyester finish," he says, "as well as working with the production crew to refine sanding of the body contours as well as transitions on the neck and fingerboard edges. We worked on this project for approximately a year from conception to the first production run." What are the basic differences between these guitars and the standard Classic Strats? "Just the addition of a more modern playability within the vintage aesthetic," explains Justin. "The two-point vintage bridge has previously never been available outside the Custom Shop. Other features include refined contours and blending, flatter radii, bigger frets, and custom colours and electronics. It's basically like one of those makeover TV shows, where the experts come in and refine things." "Coming up with anything new and inventive to do within the parameters of the Stratocaster is a challenge that surprises me every time we at Fender do it," he says with a smile. "With the Classic Player I wanted to incorporate the better parts of a Stratocaster, both old and new. Staying within the '50s vibe I kept the Kluson-style tuners that actually lock to ensure that the newer two-point tremolo will stay in tune with heavy-handed tremolo work. Vintage steel saddles were installed to maintain crystal clarity in the notes and keep all the attack, and the five-way switch has a new voice by allowing the neck and bridge pickups to be used together." There is a genuine Custom Shop vibe to this guitar - not least thanks to the finishes the team have used. Aside from the example here, both the '50s and '60s Strat are only otherwise available with a sunburst finish and we do applaud the resistance of the temptation to offer the usual rainbow of hues. "We wanted to go with true vintage colours, and throw in some Custom Shop colours made especially for this run of instruments," Justin states. In addition, the shoreline gold finish is gorgeous and faultlessly applied. The '50s Strat has a soft 'V' profile alongside a 9.5-inch radius that combines to make the flawlessly-finished neck very difficult to put down indeed. The '50s Strat features American Vintage pickups complete with another authentic touch: bevelled polepieces. With a touch of warming gain all five settings offer tones that are perfect combinations of crystal edges with genuinely toneful centres: as usual the further towards the neck you go, the smoother proceedings become. And the fourth position? It's a smoother, fatter version of a Telecaster's central selection: very useable and a nice surprise too. The influence of the Custom Shop team is apparent before you even plug this guitar in, but when you do, you are rewarded with a suptuous palette of tones. This is everything a great Strat should be and more.